Dear Music Friends of the Summer, yesterday morning we had a six stringed surf sesh with maestro Fred Benedetti perfecting the late take off and the Czar of guitar George Svoboda working on his nose riding skills. It was “Barney’s” at Cardiff at 8am, the smallest waves imaginable and after an hour or so we decided that the idea of eating breakfast held a much more magnetic pull. You ever eat at Swami’s in Encinitas? If you’re looking for killer eats plus the omnipresent vibe of North County you needn’t look any further. It’s there and we were there too! Long tales of the bliss and brutality of the music business mixed in with wishful future dreams of a joint Mexican surf adventure—we were in our element. Summer’s in session! 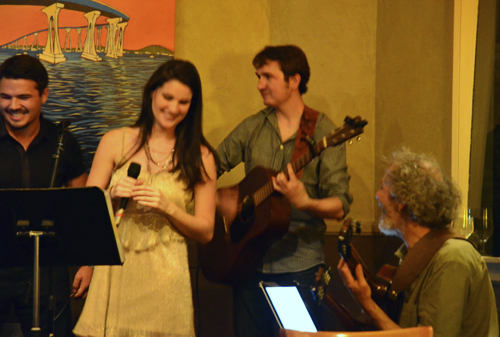 This photo captures the Ki’s scene with (left to right) Nick, Nina, Max, and Peter. Both Nick and Max school it with Nina up at USC and it was a magical night of music with these young rebels of jazz, folk and funk. 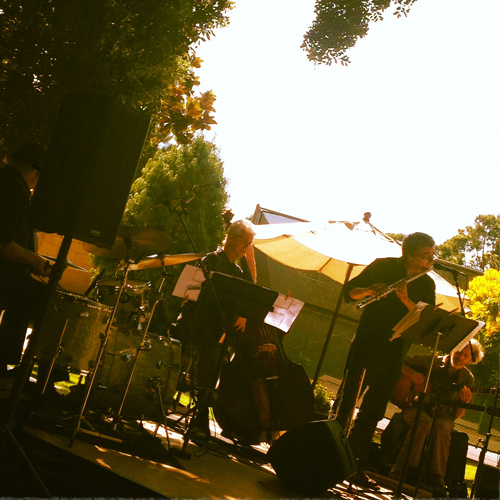 Last week we had a wonderful concert at the Coronado Library and here you see Bob Magnusson, Steve Kujala, and me playing on the outdoor stage. Sorry, Duncan was to the left and didn’t make the picture. 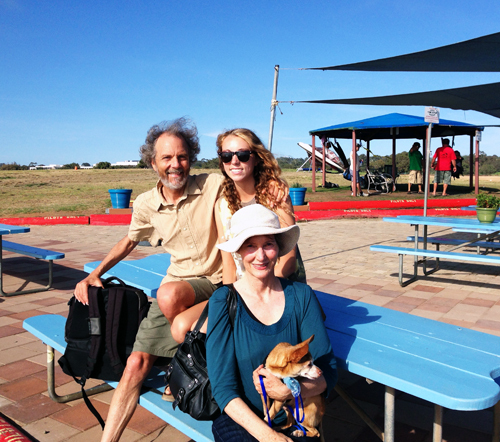 The weather was perfect and the music sounded great outdoors. 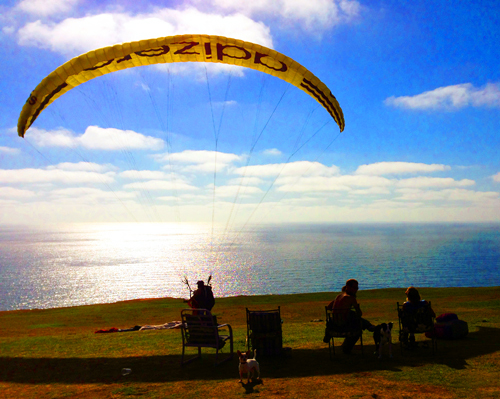 A family outing at the Torrey Pines Glider Port. What a cool scene with Peter on the left, Kylie, Stef and even little Rocky boy was there to take it all in. Taking off into the wild blue! That’s not us by the way, we were just watching. 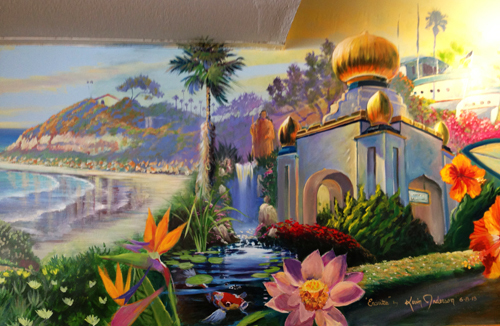 This is a mural that just got completed and it’s a visual tour of some of the cool things in Encinitas. If you want to see the whole thing plus eat a killer breakfast go to Honey’s in downtown Encinitas. We’ll probably see you there! Up for tonight I’m playing solo at the North County Fair mall in Escondido. It’s free and it’s all happening inside an air conditioned perfect world. Hah! 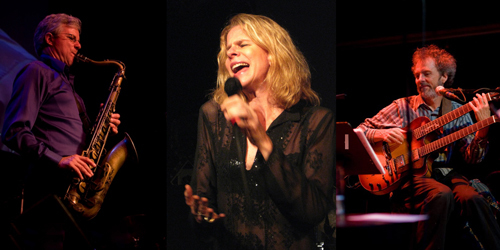 On Saturday night vocalist Kevyn Lettau and I will play a night of samba and jazz at the Roxy in Encinitas. We had to cancel the gig a few weeks back ‘cuz my elbow was not in the best of ways and now it’s working perfectly. It’ll be a nice night of music and I’ll be using both arms at the same time. I’m playing solo guitar at the Craftsman in Encinitas for Sunday brunch. I sometimes refer to it as “paid transcendence”. 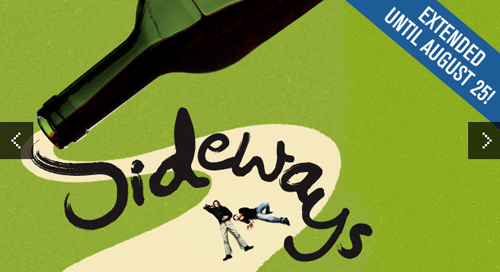 I just finished helping out on the musical score for Sideways which is the current running play at the La Jolla Playhouse. The composer is Michael Roth and he and I have worked together a lot in the past. For this one he wanted to feature my guitar playing so apparently I’m all throughout the play and throughout the theatre. It’s exciting and I know soon we’re going to experience it in realtime. If you end up seeing the play listen for my endless C, F, C, F, C, F, C, F’s—ala Steve Reich. Last up for the week is a free outdoors summer concert at the Westminster Presbyterian Church in Pt. Loma. It’ll be Tripp on sax, flute and percussion, Kevyn Lettau on vocals, and me on guitar playing in a beautiful outdoor setting. Look below for the details. That’s it good people. Thanks for reading and see you out and about. My iPod in the car is on constant shuffle mode and today while driving my tune “Rain” came on. It’s a simple little piece but I sure like the way it sounded. Lisa Hightower is singing and the beautiful lyrics by Randy Phillips tell of a love story set in a high mountain meadow. This tune is on my Calling Me Home recording and it’s one of many of my original songs set in the Brazilian/folk style. Check it out!